Walking into the French block in the morning, a raging debate can be heard, with shouts of "It's white and gold, clearly!" and "Are you blind? It's blue!" 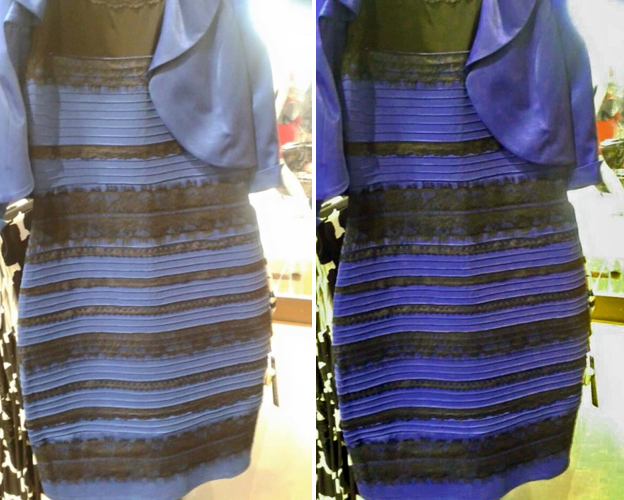 The subject, of course, can only be "The Dress", as it has been named. An overnight internet sensation, causing many social networking arguments and much confusion, is the dress worn to a wedding recently, which, due to a certain photo, appears to some as gold and white, and to others as blue and black. Above: The dress as can be seen on online stores. The dress, as can be found on online stores, is a dark blue, with a black fringe. About this there is no debate. What has caused a stir, however, is the photo, posted online, which is taken at a different angle. All started when two friends disagreed about the colour of the dress and soon, a few hours later, the situation had erupted all over the internet, with people unable to believe their own eyes, even after seeing the original dress picture. Even celebrities joined the fight, as husband-to-be at the wedding posted on Facebook: "You know it's gonna be a strange day when you wake up and after 30 seconds of interneting can turn to Grace Johnston and say 'So Kim sees white and gold, but Kanye sees blue and black'..."
The main thing bugging people has been why some see white and gold while others see blue and black. Essentially, to put simply the theory that Jay Neitz, neuroscientist at Washington University, has, different people process what they are seeing differently. To see what colour something is, the brain automatically takes away the light illuminating a surface from the what the surface is reflecting. This however, in rare circumstances such as this can be processed in a variety of ways by individuals and so the brain thinks it is seeing a certain colour due to shadows and light tricking it. There is also the possibility of coloured light hitting the dress, which the human mind believes in, as some people "attribute the blue light to the illuminant" while others "attribute it to the dress" according to Neitz. Loughborough Grammar School, Burton Walks, Loughborough, LE11 2DU. All graphics and trademarks remain the property of their respective owners. All posts are edited and published by pupils of Loughborough Grammar School and the views and opinions expressed on this website are those of the authors and do not necessarily reflect the views of Loughborough Grammar School, nor its affiliates and/or employees. Loughborough Endowed Schools is a Company Limited by Guarantee, Number 4038033. Registered in England. Loughborough Grammar School Report. Powered by Blogger.